Mix it up with the Kershaw Brawler Folding Blade. The Brawler starts with a modified tanto blade-a shape often found in tactical and rescue knives that may be required to punch through tough materials. The tanto is an ideal shape for these piercing tasks because there is plenty of metal to support the point, making it stronger than many other blade shapes. 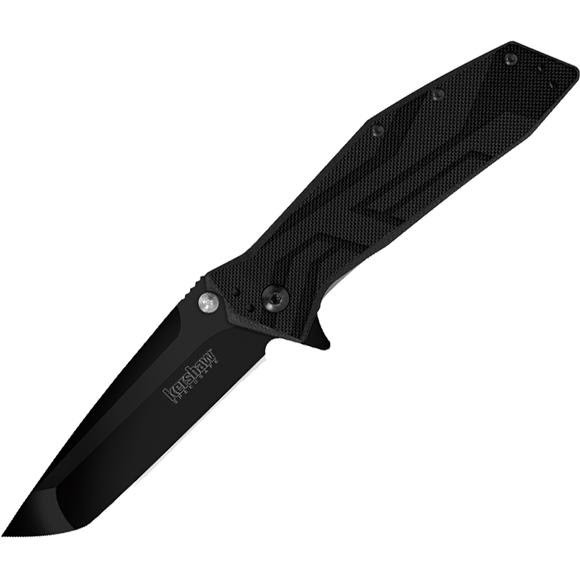 Mix it up with the Kershaw Brawler Folding Blade. The Brawler starts with a modified tanto blade-a shape often found in tactical and rescue knives that may be required to punch through tough materials. The tanto is an ideal shape for these piercing tasks because there is plenty of metal to support the point, making it stronger than many other blade shapes. You&apos;ll notice that the top of the Brawler&apos;s blade has a grind, too. This is called a swedge; it helps narrow the blade, adding to its piercing power. At the same time, the Brawler&apos;s straight belly offers excellent cutting capacity, is perfect for bearing down on a task, and is easy to resharpen. All this makes the Brawler an excellent utility knife. The Brawler&apos;s handle is just as functional. The angled handle curves into the palm of the user&apos;s hand. Jimping on the back of the blade offers additional traction. With the blade deployed, the flipper doubles as a finger guard and provides additional hand protection during knife use. For fast and easy one-handed opening, the Brawler is equipped with SpeedSafe®. Just pull back on the flipper and the SpeedSafe assisted opening system takes over, moving the blade out of the handle, ready for use. Sturdy glass-filled nylon handle scales, a secure locking liner, and our four-position pocketclip complete the package.